If you’ve got a dual rear wheel truck with rear drum brakes, we might have a disc brake conversion kit for you. 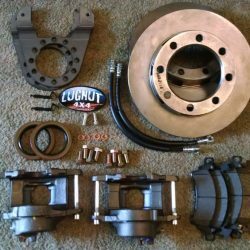 This dually rear drum-to-disc brake conversion kit fits Dana 60, Dana 70, Dana 80, 14 bolt, and Sterling 10.25 axles…that means it works for a lot of Ford, Dodge/RAM, and Chevy/GMC trucks from the last few decades. This kit does both sides of the axle, and includes everything you need to complete your conversion except brake fluid. This disc brake conversion kit fits most dual rear wheel (dually) Dodge, Chevy, and Ford trucks from the 60s, 70s, 80s, and 90s. It works on Dana 60, Dana 70, Dana 80, 14 bolt, and Sterling 10.25 axles. 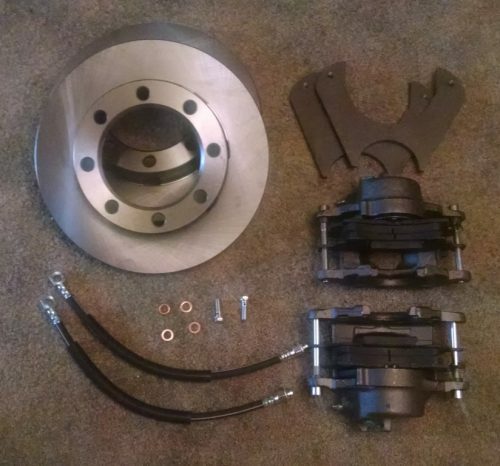 With 16.5″ or smaller dually wheels, you will need to run a 1″ spacer or grind the caliper on for clearance. **NOTE: On Ford Sterling and newer Dodge axles require about a 1/4″ lip to be removed from the back side of the hub for the rotor to fit. Finally, please note that this is a weld on kit.